Performance-driven marketers need to measure digital marketing effectiveness in order to evaluate how and where to best spend marketing dollars. Today, clicks from digital advertising, social channels, and other online sources are still unconnected to the leads inside the CRM. Marketers need to pair a prospect’s anonymous digital touch to the identified, responding lead right inside the organization’s revenue reporting system. Full Circle Digital Source Tracker adds this functionality on top of our funnel metrics product, Response Management. Together, these products capture online and offline engagements, including anonymous touches, from a marketer’s wide array of channels, programs and systems, to measure the effectiveness of their full funnel marketing strategy and contribution to pipeline and revenue. Measure the effectiveness and impact of a full funnel digital marketing strategy on pipeline and revenue. Built on our flagship product, Response Management, the Digital Source Tracker allows you to track digital engagement within Salesforce where marketing and sales users are aligned on metrics. Pair prospects’ anonymous digital touches with identified leads in your Salesforce instance to uncover your most effective digital campaigns. Evaluate which marketing programs drive acquisition, opportunity creation, and purchase. Save budget by cutting campaigns and vendors that fail to provide a positive ROMI (return on marketing investment). Connect the dots between digital offers and buyer actions. Track initial digital activity and associate it with the customer’s conversion, extending multi-touch attribution modeling and funnel metrics to upstream milestones. 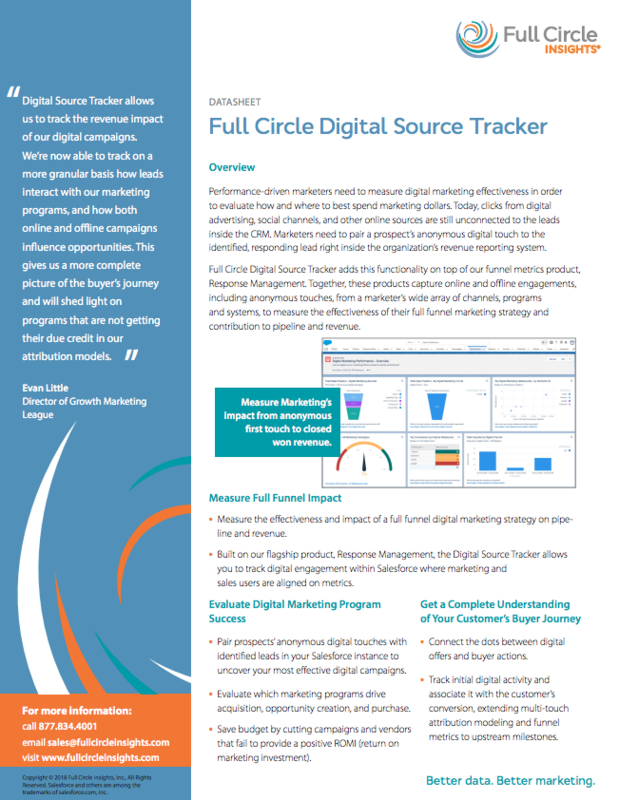 Download the Digital Source Tracker Datasheet below for more information on this product.